When I first start reading a new book it can take me about a hundred pages to get into the story, unless it is something like a Gaunts Ghosts novel (a Dan Abnett series set in the Warhammer 40k universe) or some other series I’ve been reading for years. Even when I’m listening to an audiobook the first hour or so won’t hold my attention as well as the rest of the story. This is something that really annoys me as I normally miss something important because I’ve not committed to the story or the characters yet. One way I’m trying to change that is to binge read the first quarter of a book. With Embedded I’ve not done this though as sleep has been quite demanding this week, and I’m already into the story and characters with this one. I think that’s because it’s a Dan Abnett book, but anyway that is one thing I’m going to try when reading. I want to read more in general but this is one part of reading that I think will help. 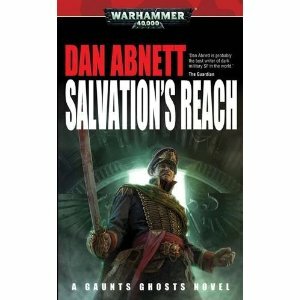 I finished reading Salvation’s Reach by Dan Abnett last night and I was very happy with this book 🙂 This is the 13th book in the series if I remember rightly and it’s one of the best. The opening of the book pulled me along impressively and I had read 150 pages within about 3 days. I’m a slow reader so this is a very good sign. It did slow up in the middle of the story but as I came into the last third of the book I found that I could not turn the pages quick enough. I am a BIG fan of Dan Abnett, in particular his Gaunt’s Ghosts series which this is one of them. These stories are set in the Warhammer 40, 000 universe in a war that has been raging for many decades. Colonel-Commisar Ibram Gaunt takes his Tanith 1st regiment on a mission which is one of the most suicidal that they have had, and with the Tanith 1st thats saying something. It is a hard military Sci-Fi universe which is inspired by the Games Workshop table top game. It would have had to of been a very bad story for me not to have liked this book. Despite the gloomy universe that it is set in there were times were I literally Laughed Out Loud and others where I felt a little choked up. Having followed these characters for this many books I’ve become attached to some of them and one of my favourites from book one died at the end of this book. So Abnett is not afraid to kill off his darlings which I always admire in a writer. In this book there seemed to be a few loose ends left hanging at the end of the book, a couple of them pretty big so I’m eagerly anticipating the next book in the series. I’d strongly recomend this book to anyone that enjoys military sci-fi, although it is the lastest in a series you dont need to read all of the books before hand but I would recommend doing so because it will make it a much more rewarding experience and you’ll get a few of the little references to the regiments history which are in this book. I’m not really a fan of comic books, I’m not against them or look down on them or anything I’m just not that big a fan of them. As a kid I would read The Beano and in my early teens, maybe even just before, I used to read the Commando action comics which I wish I still had. My Granddad got me into these little stories. These are what I would read late at night under my duvet with a torch when I was supposed to be sleeping. Most of the ones that I read were World War Two stories which at the time fascinated me. This was when I wrote my first story, it was a WWII story and it must have been really, really bad. Again I wish that I still had it just to torture myself lol Getting to my point though I am just about to start reading Imperial Gothic by Dan Abnett. It is a collection of Abnett’s Warhammer 40k comics that I have had for a few years but have never gotten around to reading. I think that I may struggle because as I said, I’m not a fan of them but I am a big fan of Abnett’s Gaunt’s Ghosts series and I want to track down more of his work.